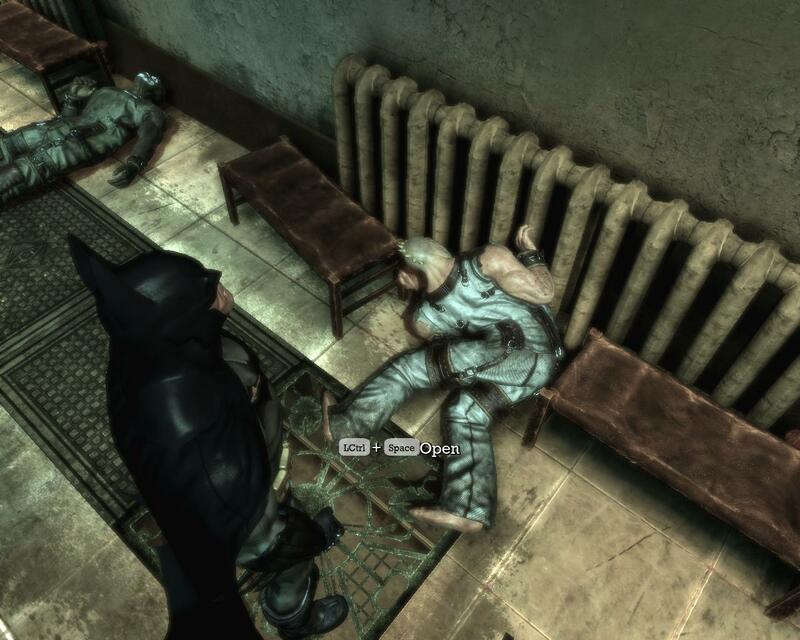 I finished Batman: Arkham Asylum tonight. The word on the street was that it was good, and lo, so it was. It turns out I really dig this sort of game– a mixture of combat and stealth, seen also in Beyond Good & Evil and The Chronicles of Riddick. I was strongly reminded of the latter, because of the badass hero. And though Riddick is plenty badass, come on, this is Batman here. Look at that spine. Ouch. You want dark atmosphere from Batman, and the game delivers: Arkham Asylum is a creepy place even before it’s populated with escaped convicts, various supervillains, and later on mutant plants. I may play it again just to enjoy it at a more leisurely pace. It’s really a blast taking out henchmen one by one… you can swoop around in the rafters or the vents, sneak up behind them, drop with a powerful kick, blow them up, and more. Combat is not bad, though I have trouble with the play style. I’m sorry, I tend to mash keys– if R reloads than hitting it several times reloads faster, right? I’m only slowly learning to face each baddie (close aiming doesn’t seem to be necessary) and hit attack just once. As my friend Chris points out, it’s a little weird that Batman only gradually learns how to fight thugs and acquires extra health and weapons along the way. How many years has he been doing this? But it’s no wierder than Batman ending up dead whenever you fail a fight. One cute bit: when you die, the villain of the moment taunts you briefly. One of the few games I can’t really find anything to complain about. A couple boss fights were something of a chore, but it can’t all be easy thug takedowns. It’s also one of the few games where the enemies notice what you’re doing and react accordingly. They start out overconfident, then start discovering the bodies of their comrades and make increasingly panicked comments. Much better than the “Today you die!” lines of many video games. It’s also nice to lose the annoying gabheaded evil overlords– I’m looking at you, Harbinger. Joker talks a lot but at least he’s amusing.